In his youth, Victor Hugo was a devote Catholic and Royalist, loyal to the Monarchy and even wrote odes praising King Charles X and his family. Suddenly, in 1827, Victor Hugo changed drastically. He became a 'Free Thinker' and started writing plays and poems against the King and the Royal Family. There is no record as to what caused this turnaround in Victor Hugo. Even in his own memoirs, there is no mention of anything of importance in 1827, except for box office receipts from one of his plays. But something did happen in 1827. Victor Hugo was inspired somehow to write an anonymous short story against capital punishment in 1828, and a stage play that caused a riot in the streets of Paris in 1830 - the same year he started writing 'Les Miserables' (which would take another 17 years to complete). What might have transpired that would alter his perspective so drastically? The old man knew he had only a few breaths left in him. He was dying. It was only a matter of days before the curtain fell on the final act of his life. For one last encore, he wanted... nay, he needed to see her. If he didn't do this today it would never happen. There it was again, that strange feeling that he was being watched. It was a sensation he had experienced many times in his long life. He used to think he was going crazy but experience taught him it was often true. Still in the doorway, the old man looked about the expansive warehouse at 25 rue de Chazelles. There were dozens of men working furiously on scaffolds and ladders, removing sections of copper, but none seemed to have taken notice of the old man being wheeled in. "We shouldn't be here," said his nurse as she pushed his wheelchair over the threshold. He waved her away impatiently. If there was one thing he hated more than this wheelchair, it was having the bothersome nurse arguing with him all the time. She had had a screaming fit when she saw him getting ot of his 'death bed', though she was not likely concerned for his health, but merely hoping he'd just lie back down and die so she could be free of him. The old man's thoughts were suddenly interrupted as he saw a familiar face. Sunlight streamed from the skylight above, illuminating her like an angel - no - a Roman goddess. It looks just like her, the old man thought to himself. But how was that possible? It had been almost 40 years since he last saw her in person but her face was never far from his mind. She haunted his sleep and inspired his work during daylight hours. She was his muse. He had to get out of this cursed wheelchair; it was not proper to meet a lady sitting down. He grasped the wooden armrests of the wheelchair with some difficulty, and pushed himself up. "What are you doing?" scolded the nurse, trying to push him down again. "You can't do that!" "Don't tell me what I can do or can't do, you crazy witch!" "What is the meaning of this?" a young, male voice called out. "This is private property!" "Forgive the intrusion," the nurse stammered as she let go of the old man, "but he insisted on coming here to see..."
The old man recognized Bartholdi's voice instantly but it was clear that the young, bearded man with long hair didn't recognize him. The old man wondered why. Had he aged so much since he and Bartholdi attended a fundraiser together? The old man's hair was shorter than it used to be, but his white beard was certainly longer. "I'm sorry," Bartholdi argued, pointing to the large crates that surrounded them, "but we can't afford any interruptions of any kind. We are on a very tight schedule..."
"Monsieur Bartholdi," the old man said, struggling to make his voice loud enough to be heard, "I know I should have scheduled an appointment... but under my current circumstances I feared I would be negligent in keeping any future appointments." Bartholdi's demeanor changed drastically the instant he recognized him, "Monsieur Hugo, I didn't know it was you! It is an honour to have you here... I thought you were..."
"Dead?" asked the old man. "Soon... very soon. So if you would indulge a dying man's request, I would like to see her before she leaves France forever." 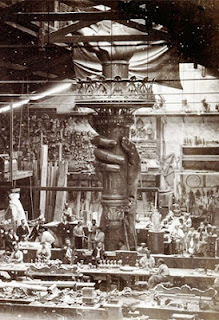 "But of course," Bartholdi replied, then turned and whistled to all the workers. Everyone froze immediately and turned towards them. "Gentlemen, we have an important guest with us today. If it were not for him, She wouldn't be here today. Not only a respected writer but a great statesman. Champion of democracy and liberty. He himself inspired the name..."
"Thank you, sir," interrupted the old man, "but you did say you were on a tight schedule, and I don't want to take up too much time with unnecessary odes. Allow me a simple moment to bid her 'good-bye'." "Of course," said Bartholdi with grace, as he stepped aside. The nurse went to the back of the wheelchair but the old man waved her away, "Just give me my stick." With a disapproving glare, she unfastened the walking stick from the wooden wheelchair's backrest, handed it to the old man and whispered, "Let me help you." He shook his head. Then, using what little strength he had left, he supported his weight on his cane and walked toward her. He could practically feel the workers staring at him, but he didn't care. The unblinking eyes of the statue greeted the old man as he neared her. He took a moment to catch his breath and stared at her calm, expressionless face. Yes, those eyes. They looked at him the same way she did. In all these years, he could never forget her eyes. He glanced over to where her large fist clenched a torch with flames made of gold. How he wished he was a younger man and could accompany her to her new home in New York. Reaching into his waistcoat's pocket, he pulled out a small silver coin. His trembling, wrinkled fingers held up the Denariu, a silver coin from Ancient Rome circa 42 BC. The coin that she gave to him all those years ago. The old man compared the Roman face on the coin to that of the statue in front of him. Their regal profiles showed a strength and femininity that were almost identical. How many pieces of silver is your soul worth? The words from his past echoed in his mind. He so wished he could take back those words. He had spent years trying to make up for the sins of his past. Not just his past but also that of his beloved country. He had endured hardships, exile and the loss that no father should experience. He never dared speak of events that took place in that cold winter of 1827, nor could he ever write it down for fear of the truth coming to light. The old man wiped away a solitary tear, "I'm so sorry. I was such a fool. Before I die, I must know... Am I forgiven... 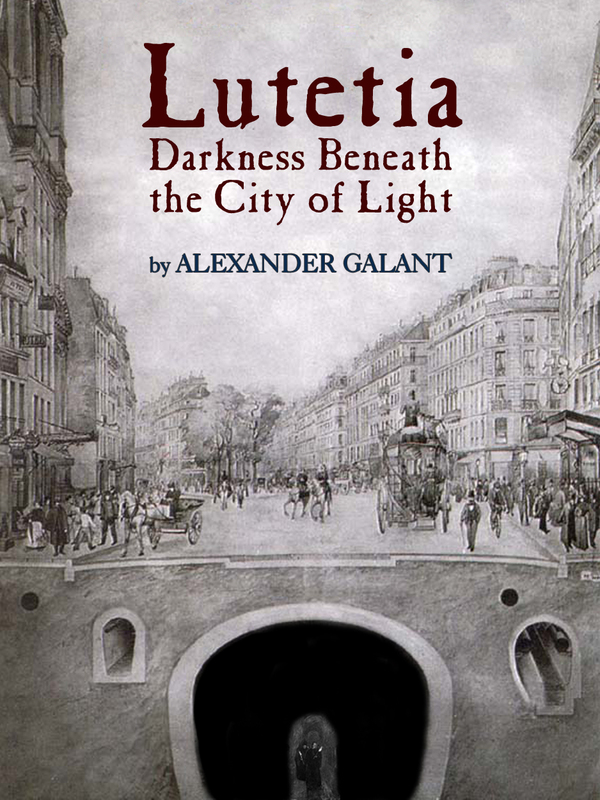 Lutetia?" New Award for My Novel! was awarded "Finalist" in the "Best New E-book: Fiction" category. While researching for Lutetia: Darkness Beneath the City of Light, I wondered, 'Wouldn't it be great if you could do a side-by-side comparison of a Paris map from a few hundred years ago to today's map?' Wait, there's an app for that, which I downloaded into my iPad. Two things I noted while using this app. Map making is certainly not the art form it used to be, look at that amazing detail (look at the Notre Dame Cathedral below). And secondly, the first manned hot-air balloon didn't happen until 51 years after this map was made - yet this map is surprisingly accurate in the layout of the Paris landscape and Seine River. NaNoWriMo update as of today (November 14, 2012) I'm just over 20,000 words. Inspired by historical events that ultimately changed France forever and influenced Victor Hugo's literary works such as 'The Last Day of a Condemned Man', 'The Hunchback of Notre Dame' and 'Les Miserables'. 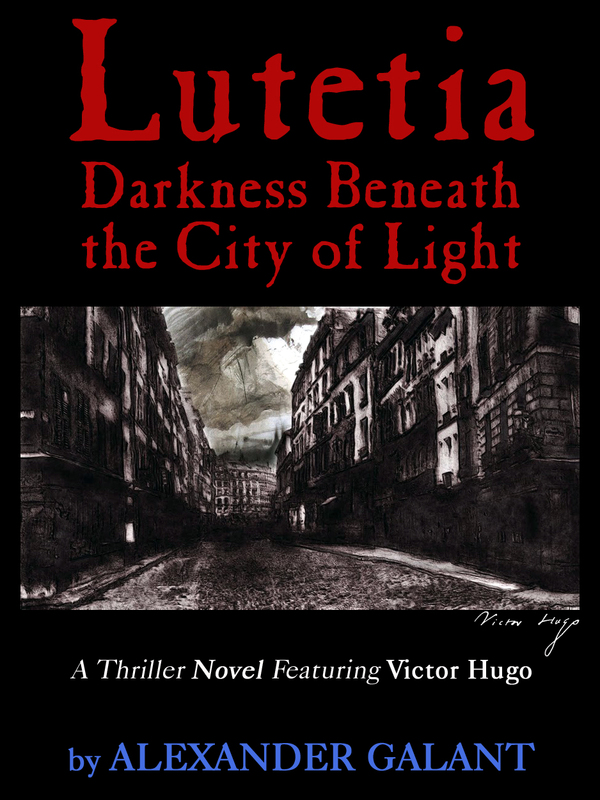 As of this 6th day of November, I've written about 8,100 words for my next novel, LUTETIA Darkness Beneath the City of Light, with only 41,000 left to go by November 30 when NaNoWriMo ends. Here's an example of one of the research tools I've been using for historical detail, an old map of Paris downloaded to my iPad. Those who have visited the Louvre will notice a difference in the area. In 1827 (setting of my novel) King Charles X was residing at the Palais des Tuileries, which was connected to the Louvre. Must get back to writing. A low, ominous tone quavered from the Notre Dame Cathedral and echoed along the Seine River. Before the lonely chime faded away into the Parisian night, it was soon followed by another peal in the same sombre pitch. It was the solitary bell in the south tower, calling to its sister bells to join it in song. But they had been taken down and melted into cannons only a few decades earlier, sacrifices for the French Revolution. The bell known as Emmanuel rang out a third time. Its echo lingered in the air, waiting for a response that would never come. Adeline lay quietly in the darkness of her room, counting the chimes from the Notre Dame. Three o'clock in the morning. Hopefully, the baby was sleeping by now. At three months old, the boy had a habit of awakening several times in the night, but presently seemed to be quiet. Adeline strained to listen for any sounds but could only hear her own breath as she gathered her nerve. Will I Reach My Writing Goal? 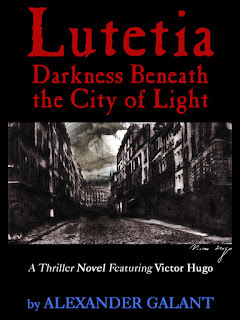 Today I commence writing my next novel LUTETIA Darkness Beneath the City of Light. I have registered with NaNoWriMo (National Novel Writing Month), so I have from today (November 1) to November 30 to complete 50,000 words. As my work progesses this month, I'll be posting links so you can read the chapters as they are being written. When it's complete, I'll take it down and begin editing, re-writes and polishing.